With Abingdon’s Motorsport CAR-nival having long been a favourite with competitors, full marks to Sutton & Cheam Motor Club for coming up with this new course in 2017. The first part is one of the established tracks, the second is the other track run backwards! At the Startline it’s good if you can angle slightly to the right for the upcoming left. The least amount of direction and /or weight changes you can do, the better. Off the line and up the gears, the left is slightly quicker than it looks. So, a wide, later entry and then let the car run out – plenty of track to play with! Start moving left for the fast right hand kink ❶. Depending on what grip / aero you have, it’s pretty quick, but the quicker you go through, the less braking zone you have for the chicane ❷. In my mind, this is a critical section. You will be in this corner longer than any other due to its slow speed, so neatness is all. I ‘sacrifice’ the first part, so as to get a really wide entry into the last right-left, key, because a longish straight now awaits. The fast left ❸ at the end is quick and as usual, a late entry is good, but people have been known to run off on exit, so don’t be too heroic. Now we go into the new section through what looks like a tight left ❹. Usual rules apply, be neat. 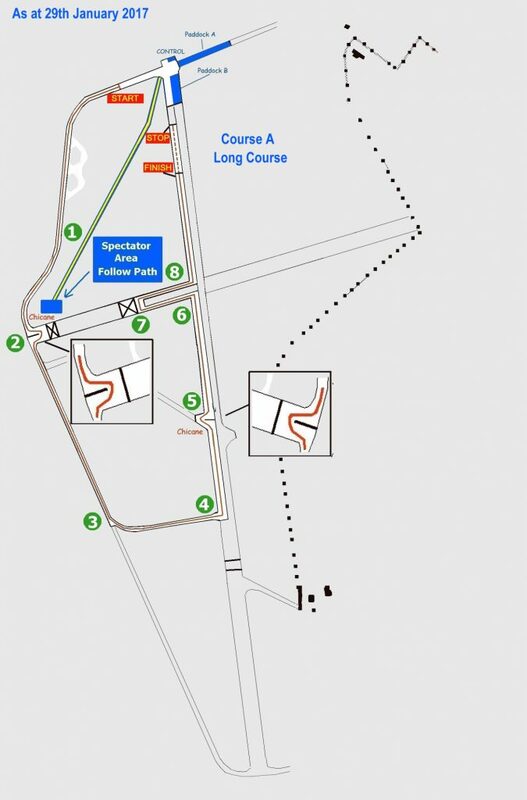 A short straight then a wider entry with a tight exit chicane ❺ takes you left-right-left. Up a short straight and then a square left ❻ leads to a right hand hairpin ❼. Back up the shute to a tight left ❽ and then a medium straight to the finish. I’ve resisted the temptation to write ‘be neat here’ at every single slow corner, but its true. When driving these big open spaces, there is a tendency to chuck it in, as there’s room to do so. There maybe room, but a fair amount of discipline is needed! Equally in the quick bends, do maximise your speed through them. They are generally regular bends with no nasty tightening up on exit. Be prepared for a quick turnaround here too. If it’s up to the regular standard, Sutton & Cheam will deliver a packed schedule. On Saturday 28th April, Round 3 of the Championship will be paying an inaugural visit to the fast and challenging Croft Circuit. A new venue for the BARC Midlands Centre team, all speed competitors are welcome to join us. Supplementary Regulations and online booking are available on the Midlands Centre Sprints page. We look forward to seeing you there!